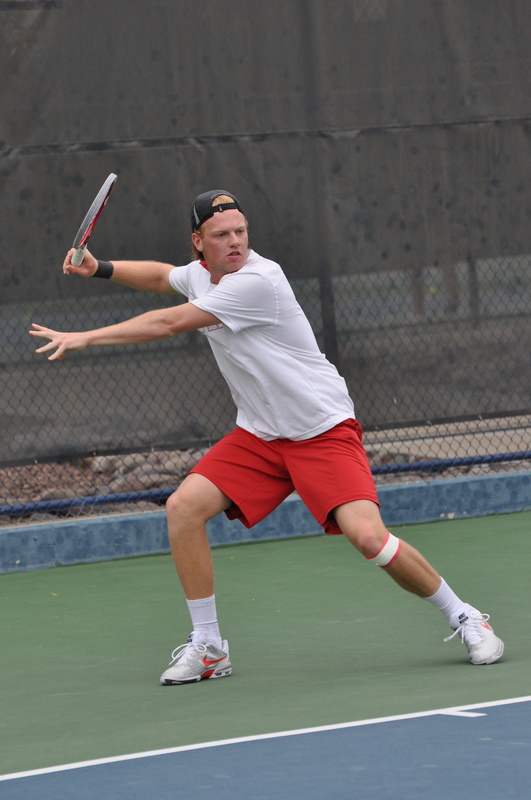 LAS VEGAS – The Utah men’s tennis team saw senior Cedric Willems advance to the singles main draw quarterfinals Thursday at the ITA Mountain Regional tournament at the Darling Tennis Center. Willems and junior Jamey Swiggart, as well as junior Justin Archer and freshman Johan Jonhagen advance in the doubles main draw to the round of 16. Despite being swept the first set against 24th-seeded Karan Salwan of Utah State, 15th-ranked Willems captured the second and third sets, 6-2, 6-3. He then went on to upset Boise State’s seventh-seeded Tomasz Tenreiro in the round of 16, 7-5, 6-2. He is slated to battle 10th-seeded Moez Chargui of Nevada Reno at 11:30 a.m. PT. In the singles consolation draw, juniors Matt Cowley and Swiggart, as well as freshmen Santiago Sierra and Louis-Philippe Gascon, all advanced to the third round of competition. In the doubles main draw round of 32, ninth-seeded Swiggart and Willems defeated Gascon and Ozzie Abraham, 8-3, while Archer and Jonhagen upset BYU’s ninth-seeded Shane Monroe and Robin Pfister, 8-3. Both Ute doubles pairs will begin competition in the round of 16 Friday at 9 a.m. PT. #15 Willems vs. #10 Moez Chargui (Nevada Reno), Friday at 11:30 a.m.
Cowley vs. Felipe Fonseca (Idaho), Friday at 1:30 p.m.
Sierra vs. Diogo Rocha (Denver), Friday at 11 a.m.
Gascon vs. Andrew Nakajima (Utah State), Friday at 10 a.m.
Swiggart vs. Peter Mimnahg-Fleming (Montana), Friday at 11 a.m.
#9 Swiggart/Willems (Utah)vs. #5 Goryachkov/Sargeant (BYU), Friday at 9 a.m.
Archer/Jonhagen (Utah) vs. Hignett/Van Leijsen (New Mexico), Friday at 9 a.m.
Cowley/Sierra vs. Douglas/Goldberg (NMSU), Friday at 10 a.m.
Gascon/Abraham vs. Cosmai (Utah State)/Harvala (Montana State), Friday at 9 a.m. This entry was posted in Schedule/Results and tagged Cedric Willems, ITA Regionals, Jamey Swiggart, Johan Jonhagen, Justin Archer, Louis-Philippe Gascon, Matt Cowley, Santiago Sierra, Utah Tennis, Utah Utes. Bookmark the permalink.